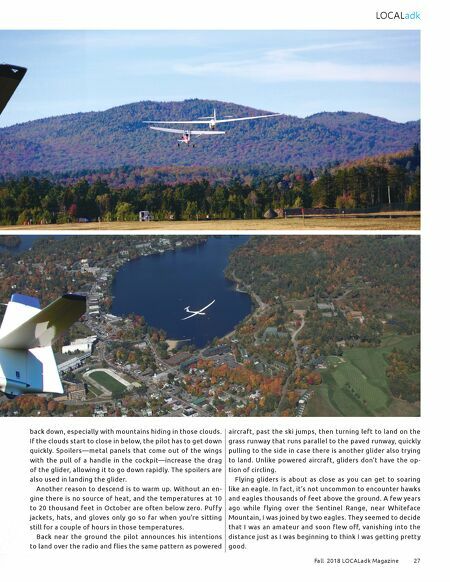 Fall 2018 LOCALadk Magazine 27 LOCALadk back down, especially with mountains hiding in those clouds. If the clouds start to close in below, the pilot has to get down quickly. 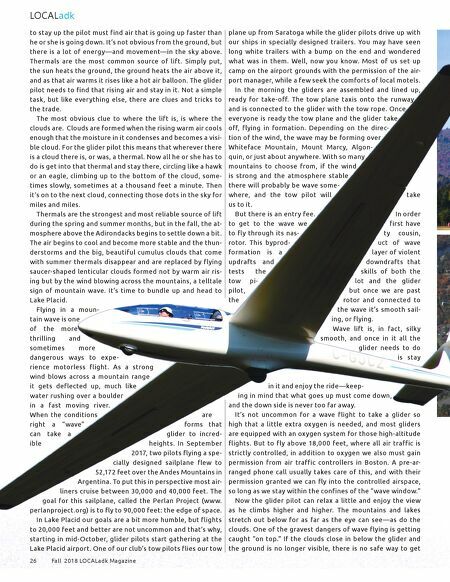 Spoilers—metal panels that come out of the wings with the pull of a handle in the cockpit—increase the drag of the glider, allowing it to go down rapidly. The spoilers are also used in landing the glider. Another reason to descend is to warm up. Without an en- gine there is no source of heat, and the temperatures at 10 to 20 thousand feet in October are often below zero. Puff y jackets, hats, and gloves only go so far when you're sitting still for a couple of hours in those temperatures. Back near the ground the pilot announces his intentions to land over the radio and flies the same pattern as powered aircraft, past the ski jumps, then turning left to land on the grass runway that runs parallel to the paved runway, quickly pulling to the side in case there is another glider also tr ying to land. Unlike powered aircraft, gliders don't have the op- tion of circling. Flying gliders is about as close as you can get to soaring like an eagle. In fact, it's not uncommon to encounter hawks and eagles thousands of feet above the ground. A few years ago while flying over the Sentinel Range, near Whiteface Mountain, I was joined by two eagles. They seemed to decide that I was an amateur and soon flew off, vanishing into the distance just as I was beginning to think I was getting pretty good.